What is Ditide (Benzthiazide/Triamterene IP) used for? 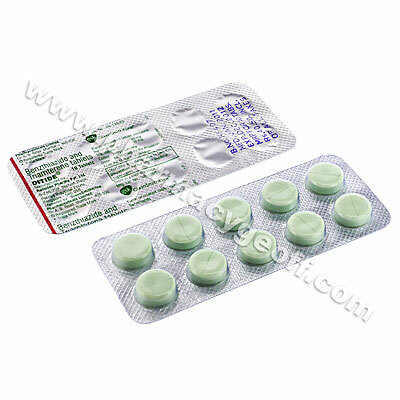 Ditide (Benzthiazide/Triamterene IP) is a medium-level diuretic prescribed to treat patients suffering from hypertension. The medication prevents the absorption of sodium in the kidneys to draw excess water out of the body to be eliminated through urination. This can reduce the viscosity of the blood allowing easier circulation. Your doctor may also prescribe this medication for the treatment of other unlisted conditions. How should I use Ditide (Benzthiazide/Triamterene IP)? Ditide (Benzthiazide/Triamterene IP) is normally administered once daily at a dosage of one tablet, but your particular instructions will be determined by your doctor based on your age, weight, health condition, and the severity of your symptoms. These should be swallowed along with a large glass of water and may be taken on an empty stomach, although a snack or meal is suggested before use if you experience nausea. You are suggested to increase your water intake during the day to prevent dehydration as this medication increases the frequency of urination. It is not recommended to take this medication prior to going to sleep as increased urination could cause sleep disturbances. What are the side effects of Ditide (Benzthiazide/Triamterene IP)? Stop using the medication and contact your doctor immediately if you experience any intense or worrying symptoms being especially cautious about any signs of an allergic reaction such as hives, skin rashes, swelling, or difficulty breathing. These conditions may require lower doses, reduced frequency of administration, or emergency medical attention in serious cases to prevent further complications from occurring. Do not use Ditide (Benzthiazide/Triamterere IP) if you are allergic to benzthiazide or if you have had a bad reaction to similar treatments in the past. These conditions may require special adjustments to your treatment to prevent unexpected health problems from occurring. Strictly use Ditide (Benzthiazide/Triamterene) as prescribed and follow all instructions provided by your doctor. Safe, suitable, and optimum dosage can vary and is dependent on the patient`s health and medical history, as well as the condition you are treating.